Emaline (Emmy for short) was born in July 2011. From the second she came into the world, I knew there was something different about our little girl. First, she didn’t have the strong cry and ruddy cheeks that her sister had only 2 years prior. Emmy emerged blue and let out a stilted warble, scaring me beyond belief. Several nurses swiftly carried her into the NICU because of fluid that had built up in her lungs. She spent the next 8 days hooked up to beeping machines, and we were only able to hold her for short spurts of time. We wanted so badly to take her home, but we knew she was in good hands with the kind nurses who calmly answered our questions and reassured us that Emmy was doing very well, even though the loud machines seemed to indicate otherwise. On one of her last days in the NICU, my dad was holding her in his arms. She was sleeping peacefully when, quite unexpectedly, a broad grin spread across her petite face. Startled by her smile, which was bigger than any I’d seen before, I looked curiously at my dad. There was an unspoken uneasiness between us. Emmy’s smile was different, and it made me nervous. Emmy left the NICU with a clean bill of health, except for a heart murmur. The doctors let us know that we should schedule an appointment with a cardiologist, but they also told us that heart murmurs in babies were quite common, so we shouldn’t worry. 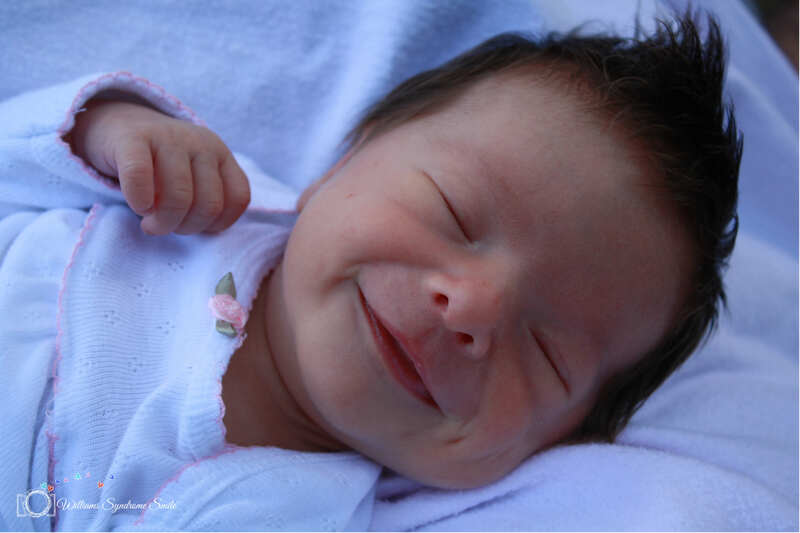 My husband, Dan, and I couldn’t figure out why a tiny baby would have such a broad smile, but I was encouraged by the notion that she certainly seemed happy! Five weeks passed, and we dutifully attended our cardiologist appointment…which changed everything. We were shocked to find out that Emmy had a more serious heart problem than we originally thought. Furthermore, her heart condition is prevalent in people with Williams syndrome, which lead our cardiologist to connect the dots. It was she, our excellent and caring cardiologist, who first suggested Emmy’s diagnosis. Shortly thereafter, Emmy had a blood test to confirm the results. I talked to other parents who had travelled this road before and finally took the advice of another Williams syndrome mother who told me that it was ok to be upset but that I needed to eventually pull myself together for my daughter, who would need me. Slowly, slowly, slowly, I accepted the diagnosis and was able to move on. I became willing to take this journey with Emmy and resolved that, whatever the future might hold, I would just love her–fiercely and without reservation. But Emmy still seemed miserable. For the next six months, she acted as though she were underwater. She didn’t smile once, barely interacted with people or toys, and cried constantly. While the diagnosis explained her initial beautiful grin, which is particular to her syndrome, she didn’t share it with us again for quite some time. I later found out from other Williams syndrome parents that many of their children took a while to find their smile as well. Not only has she been smiling ever since, but she’s made everyone else smile too. Her big, genuine smile no longer makes me uneasy. It’s a gift that instantly lights up a room and makes others grin right back. Emmy has changed my life for the better. I’ve discovered a new beautiful community of people with special needs and parents whose children have special needs. I’ve gone from “I can’t do this” to “I want to do this.” I’ve admired the tenacity of my daughter, the milestones that take a long time to come but are well worth the wait, the tight bond between sisters, and the kindness of strangers. Of course, not everything has been easy. 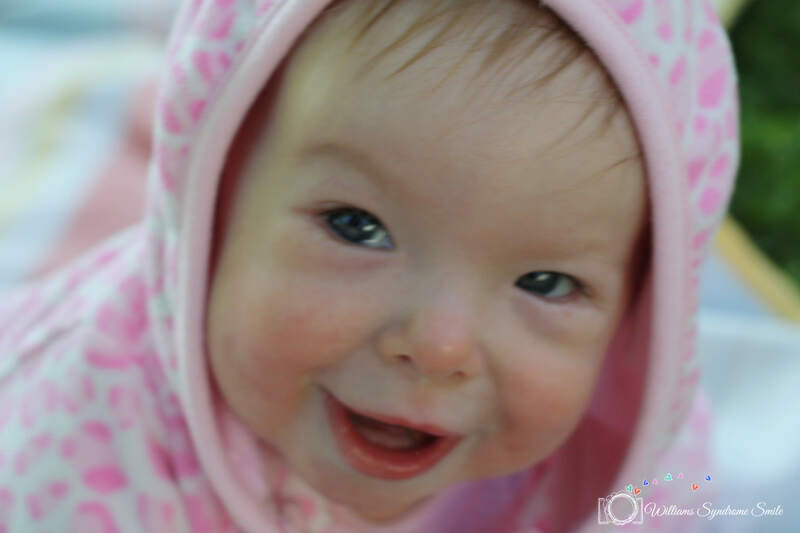 But in this blog, I intend to honor the love and smiles that Emmy has given to us and to others. She is a sweet soul, and I am so happy that she is ours. I have a granddaughter who has Williams Syndrome she is my special grandchild. She had touched many lives and is loved by all. Your daughter is beautiful. Thank you, Linda! Your granddaughter sounds wonderful. Hopefully I’ll get the chance to meet her one day! My little girl has WS. She is 10 yrs old now and she is such a joy. She is so emotional. With that come good and bad. You always know how she is feeling. She loves people. Also comes with good and bad. She has no stranger danger. But Im always praying that she stays safe. She makes so many people happy. I have went through alot of the same emotions that you have. And still do once in awhile when she has a bad day. But the love that she shows me is the very best!!!! BOY do I LOVE MY LITTLE GIRL. Looking at the pictures and reading about Emmy I can tell she is loved. Im praying for you and your little girl to make it over this hurdle that she is facing. These little kids are so strong~ I have no doubt that she is going to make it and come out stronger than ever! 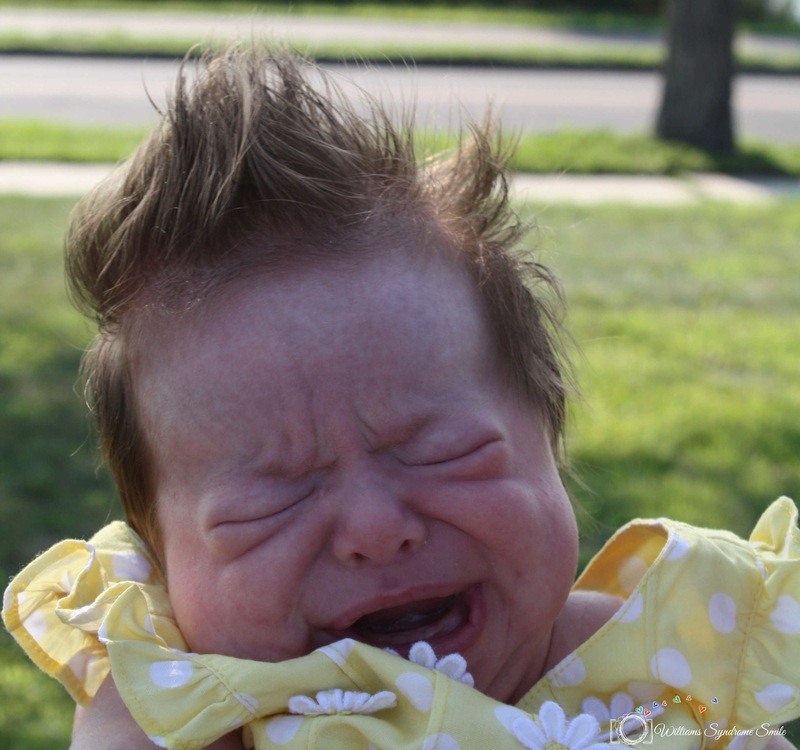 Wow, what a shock of hair on such a new baby. Sarah was exactly the same, although she didn’t have the heart condition(s). She has a few other problems, has ‘out-grown’ her multiple forms of epilepsy but her Autism is more prevalent than her Williams syndrome. Prom King! Wow, that’s awesome. Congratulations on his graduation as well! Thanks for reading my blog, Linda. Emmy is a very strong little girl! I have been thinking of your family since Kelly told us about Charlotte and Emmy. My little girl has just turned 1 and is preparing for her surgery for SVAS in a couple of months… she has a twin sister who is so laid back, unlike her emotional sister! Appreciated reading through your posts, thank you. Thanks so much for visiting my blog! Glad you like it. Our girls are very close in age! My beautiful daughter Katie who will be 21 next week was given the gift of Williams Syndrome. She has graduated from school now and this summer is going to be on the Special Olympics BC National team for Rhythmic Gymnastics..we are very proud of her. I like that you said Katie was given the gift of Williams syndrome. I love that phrasing! Awesome that she was selected for the Special Olympics BC National team!! I am in the process of having testing done on my one year old foster baby. Her name is Emee (! ), short for Emeline! I have had her with me since her release from hospital at one month of age. She did same thing as your Emmy, the smile in her sleep or to a wall or where ever but not at us, not for a long time. Now she smiles and it sometimes leaves as suddenly as it appears. But she laughs and seems happy most of the time. This is one among several similar characteristics. A main thing I am wondering is if your daughter does an extremely high pitched shrieking. This is something so significant to our Emee’s personality. It’s like its her way of communicating. She does it when upset or when happy. She will do it for a length of time or in short quick bursts. And it is so piercing it actually makes my ears ring! Also, at nearly 13 months of age she is not yet crawling, can finally sit up without assistance but will still topple over if she gets distracted by something. So happy to have found your blog here and to see that you respond to people who submit. Thanks for your time. ~A.F. I’m sorry it took me so long to respond! WordPress didn’t inform me that I had a new comment for some reason. Anyway, happy I finally found your comment! I can’t believe our girls’ names are so close! I haven’t met another Emaline (or Emeline). Our Emmy did shriek but it wasn’t out of happiness. It was always out of misery. 😦 She definitely had a lot of tummy trouble early on. Luckily, all of that has resolved. If Emee does test positive, let me know and I can direct you to a great group of parents on Facebook! That is frustrating! Hopefully they approve it soon. Yes, please definitely let me know either way! 🙂 I’m glad you found my blog! I am so pleased to have found your blog today. 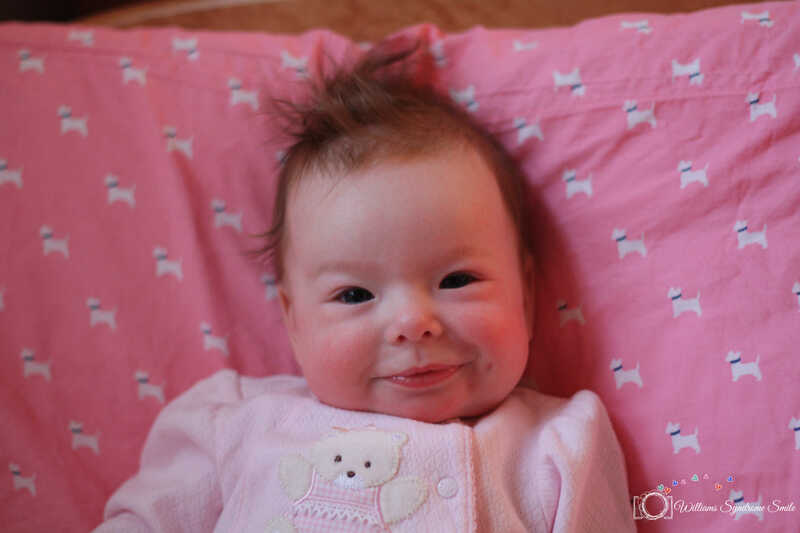 This afternoon my husband and I were advised that our three week old daughter, Holly, has Williams Syndrome. After lots of googling, I was feeling terrified of the unknowns and the issues she may apparently face. We are madly in love with our little girl and were naturally scared for her future. Reading your blog has made me cry. I even cried trying to tell my husband how lovely it is. Your story of Emmy’s time in NICU and receiving the diagnosis mirrored our experience so much. Anyway I just wanted to drop a line to say thank you so much! Your website has been an absolute godsend for one very exhausted and scared mum and has given me strength again. I’m so glad you left a comment here! And I love the name Holly. 🙂 Congratulations on the birth of your daughter! I know that receiving the news about WS is unbelievably shocking. I felt like I was in a dream for the longest time. I didn’t feel prepared at all to have a child with special needs, and I thought other people were much more prepared than I was. Now that 4 years have gone by, I see how I learned as I went along. I just put one foot in front of the other and kept soaking in information — whether from the Williams Syndrome Association or other parents or teachers or physical therapists or doctors or from Emmy herself. With each little nugget of information, I felt a ton more prepared to handle this. The first year was overwhelming. But after that, everything calmed down quite a bit. I heard this quote somewhere, and I love it: “Williams syndrome is a journey I never planned, but I sure do love my tour guide.” That is so true! We love Holly beyond words and I think what was so scary was reading the medical pages on WS. They seem so clinical and cold and describe WS almost like case studies or textbook situations. I know that she’s a little individual and her journey won’t necessarily follow the same path as what the medical pages state, however, it still gets you worried for her future. Your blog is so personal and human and it’s so clear that Emmy is such an incredible little person. Your stories have also made me see that although we might have some hiccups along the way (your blog about trying to get Emmy into nursery school and the one about the New Jersey gym made me cry out of fear for our little one), if we raise her with the best people around and embrace the kindness of others then I think she will have a happy life. Thanks again Vanessa. Words can’t describe how much your blog has made me feel better about the whole thing. Hello!! Your daughter is gorgeous! I, too, have a similar story about my daughter, Blaise. Blaise is the greatest gift that God could have given us. Life would be so different without her…I can not imagine. Both her dad and I say often that we have been chosen to raise her and that we are so fortunate. Today, she is 27 years old….and I don’t know where the time went. Keep raising and writing about your daughter….it is very inspirational…glad to have found it. Just want to say thank you for sharing your story. My 10 months old daughter has WS. We are from Singapore. Your story has been inspirational and to be a honest, a relief to me knowing that it’s not as bad as I imagine down the road. Thank you so much for your comment! I”m glad you connected with our story. Williams syndrome is nowhere near what it seems like in the beginning. It does get better and better every day. Thank you for sharing your story. While I was reading your story, I said to myself that was exactly what I went through. It was a relief to know that my 9 months son who has WS might have a chance to live normal life despite all the difficulties and health problems he has as your daughter. I was so worried and scared about his future, but reading your story gives me hope that future will be better.